I got to brag about my sidekicks! My wigglers’ gizzards were ringing today! For an hour, I was yapping and bragging about my buddies. 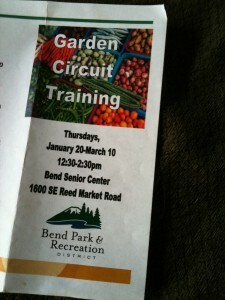 My wonderful scrap eating sidekicks were part of a series in the Garden Circuit Training hosted by The Bend Senior Center. Last month, I met with the leader of the series, Becky. We chatted over coffee, and she invited me to speak. I never pass up an opportunity to share my experiences with Red Wigglers, but I had to wait a MONTH! 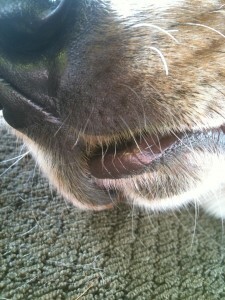 So I kept myself occupied with my fury sidekick, Lucy! So today finally arrived! 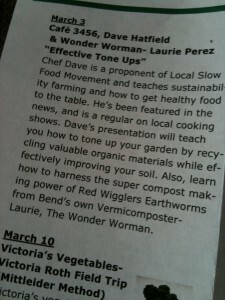 I walked in with a bucket o’worms, veggie scraps, handouts, a flash drive, and my knowledge! I was introduced to the first presenter, Dave, the chef at Cafe 3456. His restaurant is at the Bend airport, and he’s also a key proponent in the Slow Food Movement. Dave composts his waste from the restaurant and from others around Bend, too! Then he uses the compost to grow his own veggies for the restaurant. He did a great job and got all “scientific”! I was a bit nervous, but knew once I put my hands into the bucket, I’d be fine! I was in the zone, the element, my place of zen! Now I know why I quit my “real” job! Another great post Worman! Keep on Wiggling!